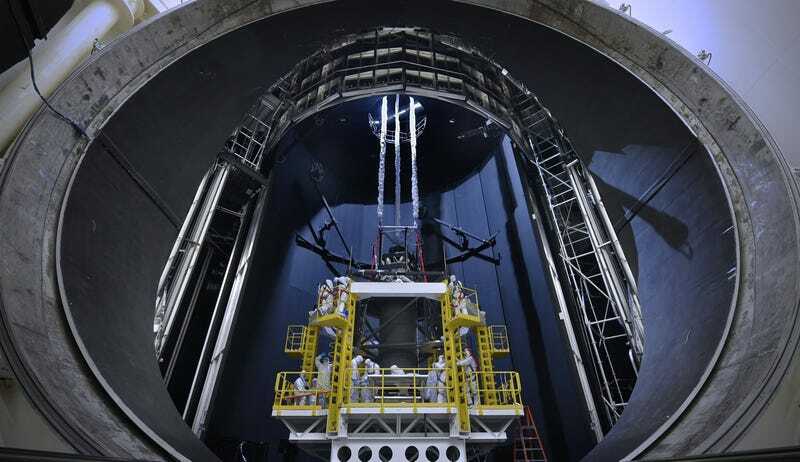 The James Webb Space Telescope is about to be tucked into a massive space simulator as part of its testing to ensure it can survive the harsh orbital environment. The telescope is the next-generation planet-hunter, intended to check exoplanetary atmospheres for signs of life. We’ve previously seen some amazing shots from the telescope under assembly — a massive spine that will support the entire structure, a sunshield that dwarfs the puny humans around it, and a gorgeous set of mirrors that will make the science happen. Since last time we checked in on it, the heart of the telescope wasboxed up and rotated around to in a gravity sag test, making sure it was structurally sound in all directions, and dropped in a deep-freeze to check that everything would function in the blackness of space. But now the telescope is about to undergo a much harsher test: time in the oversized thermal vacuum chamber, Chamber A, previously used to stress-test spacecraft for crewed space missions. It’s now being swarmed by engineers and technicians loading in lifts and structures to support the James Webb Space Telescope for testing. Mega-machines are inherently amazing. Mega-machines that have something to do with space are just flat-out awesome.